Based on the paper by Tiun Han et al. (ACS Synthetic Biology, 2017), we created 4 different split T7 polymerase variants expressed from a ploycistronic expression cassette. In order to make sure, that the activity of our split variants is not due to skipping of a stop codon behind the first fragment and corresponding production of full-length T7 polymerase, located the C-terminal split part to the 5’ end of expression cassette (Figure 3). Figure 3: Split T7 polymerase variants generated in course of this project. Numbers correspond to amino acid position with respect to the full-length T7 polymerase protein. Applying our phage production toolbox standard, we then produced geneIII-deficient M13 phages encoding the different T7 split variants as well as a full-length T7 as control. Next, we generated a corresponding E. coli selection strain transformed with an accessory plasmid expressing gene III form a T7 promoter. Hence, only phages encoding function split T7 variants would be able to activate expression of gene III an propagate (Figure 4). Figure 4: Creating a selection circuit linking (split) T7 polymerase activity to phage propagation. The E. coli selection strain carries an accessory plasmid encoding gene III driven from a T7 promoter. Therefore, only phages encoding a functional T7 polymerase are able to propagate efficiently on the selection strain. To validate, if our selection circuit is working, we infected the aforementioned E. coli selection cells with at identical multiplicity-of-infection (MOI) with the different Split-T7 encoding phage variants as well as the full-length T7 control phage (Figure 5). Figure 5: Figure 4: Single-round propagation of M13 phages encoding the indicated split T7 polymerase variant (see Figure 2) or a full-length T7 as control. The propagation factor corresponds to the fold increase in phage titer as compared to the used inoculation titer. Data are means ± standard deviation, N= 3 replicates. As hoped, all phages were able to propagate on the selection strain, albeit to different degrees. Remarkably, the degree of phage propagation almost perfectly represented the efficiency of the underlying split T7 variants as reported by Tiun Han et al. (ACS Synthetic Biology, 2017). 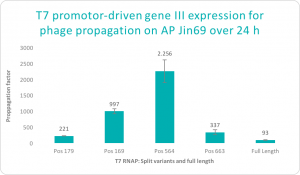 In fact, propagation was most efficient for the phage variant encoding the T7 split at residues 564/565, which is also the most efficient variant described by Tiun Han et al. (ACS Synthetic Biology, 2017). This data indicates, that our accessory plasmid indeed applies a selection pressure and effectively links the “fitness” of the encoded split T7 variant to the phage replication. Importantly, the full-length T7 polymerase control phage was weaker as compared to all split variants in this particular experiment. A possible explanation for this seemingly contradictory observation is, that the split T7 variants might be simply more quickly and efficiently translated (due to the smaller size of the two split T7 polypeptides as compared to the full-length T7 and the presence of individual RBSs driving translation). While this expression kinetics effect might average out in long-term experiments running over several hours, it certainly has a major impact in context of this PREDCEL experiment, where phage propagation time is limited to 1 h.
Due to the highly efficient propagation of our phage encoding the T7 split at residue 565/564, we sought out to take the challenge of using our PACE apparatus and corresponding continuous flow setup for the final evolution experiment to further improve this split T7 variant. Details are described on the PACE (http://2017.igem.org/Team:Heidelberg/Pace) page. In brief, we created a mutagentic selection strain by co-transforming mutagenesis-inducing plasmid MP4 (Badran et al, Nature Communication, 2015) and our pT7-geneIII accessory plasmid. Phages were propagated for 3 days with a flow rate of 1 lagoon volume/hour, followed by plague assays. The split T7 fragment of 5 clonal plagues was then amplified by PCR and sanger-sequenced. Esvelt, Kevin M.; Carlson, Jacob C.; Liu, David R. (2011): A system for the continuous directed evolution of biomolecules. In: Nature 472 (7344), S. 499–503. DOI: 10.1038/nature09929.